One image from the latest 2H11 Technic set still to reveal, has finally surfaced online (8081, Extreme Cruiser). The image now available still contains copyright watermarks... As it would go against TLG will, it won't be published here until new images do appear. Sorry! Resting with a text description of this model... we would say it is a mid-size black Off-Roader or SUV class vehicle, probably in the 600-700 parts range. It doesn't include any PF off the box, just manual functions instead. Among these we can see: Steering front axle via HoG, Rear suspension (unknown if also used for the front axis but likely yes, in some way); Opening hood at front and rear door. From the aesthetics point of view, it looks really awesome and realistic. The overall black color with red bands under the doors and on the hood also look quite nicely. It looks to exhibit a considerable clearance to ground, what makes me think whether it uses some of the new parts already mentioned to be included with 8110, Unimog U400 . From its appearance in this still low quality image and as others have already said, I do also believe this is a 15L wide vehicle (double 7L length panels plus 1L spacing, in the front of the hood). The wheels and tires are respectively 43.2mm D. x 26mm and 68.7x34R, as used in 8262, Quad Bike and the front or the rear axis of some other models like: 8048, 8049 and 8069. This also gives a good reference and an idea about this model's scale. Some are also expecting that part "Axle and Pin Connector Toggle Joint Smooth" to become released in black again, which turned to be actually quite rare and expensive. Functional motor under the hood, still unknown but expectable. Inclusion of the new "Steering CV Joint Axle" also unknown, but likely along with a diff on the rear axle. On the box right side we can see one yellow band with the inscription "Limited Edition", similar to another 2011 set. It shouldn't mean nothing else than a restricted availability to fewer sales channels and stores, what probably explains why the image from this set was so successfully kept in secret this long, until it get out. 54,20€ is the know price so far, for the Extreme Cruiser, as listed by the store who leaked this image. Thanks for the hint, Ondra. Do not thank me, thank Google :-). Here are some my observations.First of all, I very like design and colour scheme of the car.It looks very massive like a car which can handle any obstacles.But very similar to 8297(Like some 8297 evolution). Black panels will be very useful in MOCs. Second of all, I think it will be very popular at childrens.Car with suspensions and big tires=Childrens dream.Lets hope this car will be also solid to survive crashes and jumps from stairs :-D.
And the last one here are some negatives-I really miss another functions like winch or changeable height. it is not the first time, we have been asked to remove pictures with watermarks. Lets say it turned the price to pay, resulting from the proximity to the LEGO Ambassadors Program. Some comments on the 8081 Super Cruiser ..
- Design is great. It looks like they got inspiration from Range Rover or something similar. 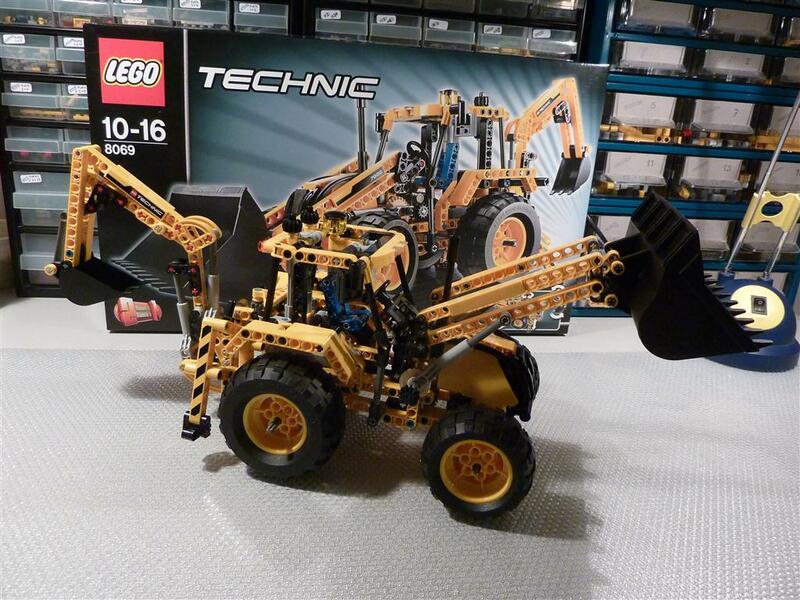 Design is getting more and more accurate in the Technic line. - Size is medium/small. Given the price tag - 54 EUR, which is a bit more than half the price of 8297 - the model will probably do not have many functions. Judging by the small black panels in the front, this is a medium sized model. Maybe 15 studs wide. The wheels are definitely not the ones off of the 8297, they are much smaller. It also says "Limited Edition" on the side of the box... Whatever that is supposed to mean..
"limited edition" probably just means it will not be available in most shops. I think that the front axle will be very similar to 8435. So, maybe we will get the little rack with ball joints. Besides, the rims of this 8081 are the same as 8435. +1 with the odd LBG connectors on the roof. Black would be better. and +1 for the 15L wide (on the hood at least) : 2 black panels (5L wide) + 2 red liftarms (2L) + angle #2 180° (3L). The way 8109 and 8081 are deisgned make me think of Creator sets. That's maybe because of the bicolor scheme. It also seems from the small picture in the top right corner, that the two doors (left and right) can be opend. And the age-range from 10-16 seems to show a certain complexity of the model. I'm not exactly interested in this sort of suspension-and-steering set up when they are the sole functions in Technic sets. They don't exactly do much for making me want to buy a set, especially when they are basic functions in other sets. This one is very aesthetically appealing though, something that those panels have done a great deal to improve in the last few years. It would seem that the rims are not excactly the rims that were used in 8262. Could this be a new part? As stated in comments from a newer post, these wheels a newer variant, not yet listed at BrickLink.